Thyroid conditions have become very common in the human population due to many reasons, every alternate person mainly females are affected with various thyroid conditions and as a Dentist, it is important for us to learn the various effects of Thyroid and Pituitary problems seen on the Oral cavity. The Oral manifestations of Thyroid and Pituitary problems are huge as the effects are seen right from development or Eruption of teeth and also seen in developed teeth. The other parts of the oral cavity are also affected in some cases. It is important to keep in mind that certain types of ORal manifestations can be caused due to any Thyroid condition or Pituitary condition and in some cases, the problem can be fixed by treating the underlying Endocrine problem and in most cases Dental treatments are necessary. 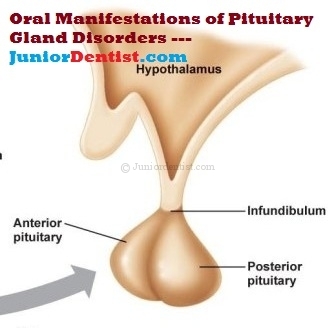 Here we are going to discuss the Dental problems or Oral Manifestations associated with Thyroid and Pituitary gland diseases and not the general clinical features. Yes, Hypothyroidism can be hereditary. Most common cause of hypothyroidism is autoimmune thyroiditis also called as Hashimoto’s disease which is hereditary.